I have a secret crush – on a cat! Art Cat to be precise. I taught children for many years as an arts educator at the Children’s Studio of the Carnegie Museum of Art. Our mascot was Art Cat, and he was an adorable little guy that one of the other teachers made using plaster, fabric and paint. In honor of Art Cat I’m going to share a modified version of making a plaster animal. While my plaster cat (cat, not cast – it is not a typo) project is certainly fun to look at, I figured why let it sit on a shelf after the art-making is over? This isn’t just a sculpture, it’s also a puppet. After the creating is over, the creativity doesn’t have to stop. Your child can use this pillow case (I’ll explain that in a bit) puppet for hours of pretend play. And by the way … your child doesn’t have to make a cat. She can make a plaster dog, bird, bunny or whatever other animal he chooses. · Plaster roll: You can find this at most craft stores. It’s a roll of white plaster sheeting that you can cut and wet to apply. 1. Blow up the balloon for your child. This will be the animals head. 2. Cut the plaster into strips. Fill a bowl part way through with water and dip the strips into it. 3. Cover the entire balloon with plaster, except for the bottom. Your child will use the bottom as a hole to put her hand in to make the puppet move. 4. Cut the cardboard into triangles (if your child is making a cat – or another shape for another animal) to create ears. Attach the ears to the top of the wet plaster balloon. Cover the ears with more plaster, securing them to the head. 5. Let the plaster dry overnight. 6. When the plaster is completely dry, poke the scissors through the bottom of the balloon (if the balloon hasn’t started to deflate already you may hear it pop). Trim the area around the bottom of the plaster so that it is large enough for your child to comfortably get her hand in and out of. Even though I do believe that kids should make their own art, young children will need either help or a parent to do this step for them. 7. Have your child paint the head, adding eyes, a nose, a mouth, whiskers and any decorative details. Let the paint dry. 8. Line the hole in the plaster with glue. 9. Have your child put her arm into a pillow case, moving her hand to the closed end. She can insert her hand into the hole in the plaster. Help her to press the pillow case fabric against the glue. If the pillow case falls out when she plays (the glue may not hold forever), just have your child put the pillow case back in when she uses the puppet. If you're looking for more animal themed crafts, visit my Pinterest board that features an array of imaginative projects! Just click on the words "animal themed crafts" in the sentence before this one. The real cats enjoyed investigating their new puppet friend. Follow Erica Loop's board Animal Art for Kids on Pinterest. This looks like a great activity for the kiddos. Thank you! That's adorable! 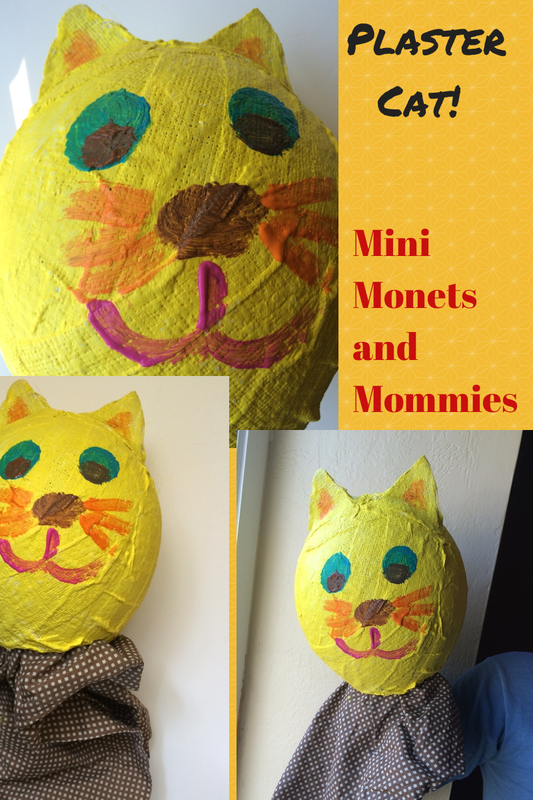 I love paper mache and have made several projects with my grandkids. I think we'll try this! What a cool idea! My kids will LOVE this. That's adorable! Thank you for sharing! I'm sure my kids would love this! These cuddly and adorable creatures are a pleasure to look at. They are additionally more intelligent as compared to other breeds. They're playful and also known to be very social.